Inspired by its breathtaking setting, Architextures’ Christi Johaningmeyer designed this memorable blufftop residence. 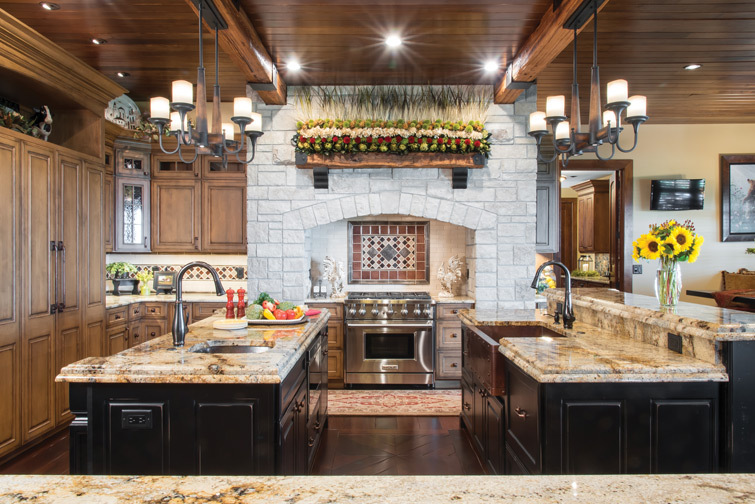 Natural materials dominate the kitchen, from the wood-beamed ceiling to the limestone range alcove and granite-topped work islands from Ford Marble and Tile and Heirloom Black Dynasty maple bases. Oiled bronze fixtures, hammered copper sinks and decorative tiling further emphasize the rustic ambience. Overlooking the Mississippi River, the breakfast nook includes bench seating that conceals built-in storage. The 22-foot great room ceiling is crowned by circa-1880s beams from Historic Timber and Plank, each weighing up to a half-ton. Heavy striated drapes, suspended from individual fringed cornices, line the great room windows without obscuring the majestic river views. Richly appointed in leather, velvet and dark woods, this vast gathering space retains a comfy, convivial atmosphere. Faux-painted to resemble leather, the ceiling of the formal dining room is actually embossed metal. Caspar chairs in leather and distressed chenille surround the solid alder table. 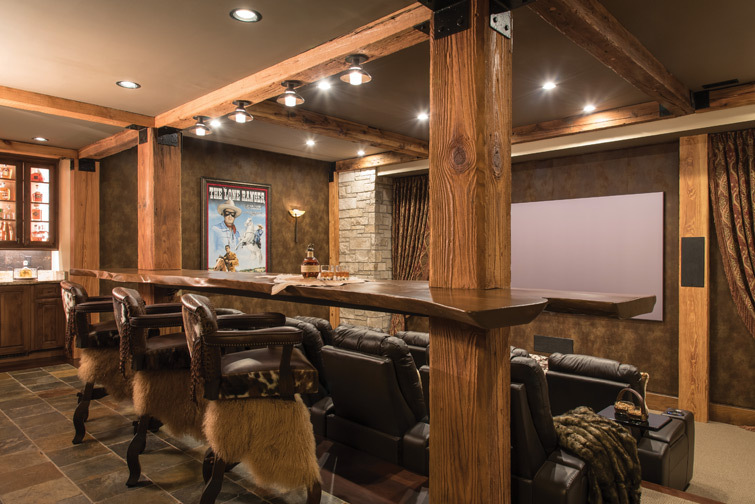 The home theater’s acoustic wall panels have a leather-look finish and whimsical bar chairs. Michael Langhorst Construction's work is featured prominently in the master bedroom, bar and wine cellar. A masculine retreat for the owners’ college-age son, the bedroom has a wood-beamed ceiling, faux leather drapes, leather-trimmed bedding and a wheeled, burlap-covered bench. Offering balcony views all the way to the Arch, the master bedroom features a wood-beamed ceiling, walnut-stained Accents of Salado furnishings studded with oversize nail heads, and velvet bedding trimmed in faux fur. A beamed arch opens from the master bedroom to this private, vaulted sitting room with a floor-to-ceiling fireplace, leather and basket-weave cut velvet sofa. “The river got us,” the couple agrees, and they wasted no time acquiring the 11 acres of magnificent terrain, perched high on the bluffs. Aware the site presented significant challenges, they rented a nearby home from which they could supervise land development and the construction process. But there was never any question who would design their new residence. It took 20 months to remove tons of rock and level the property in preparation for building. Meanwhile, Christi turned her attention to interpreting the owners’ vision from the dozens of photos they had collected. They were looking for a low-profile plan reminiscent of a Montana mountain lodge that would blend into the gorgeous natural surroundings. 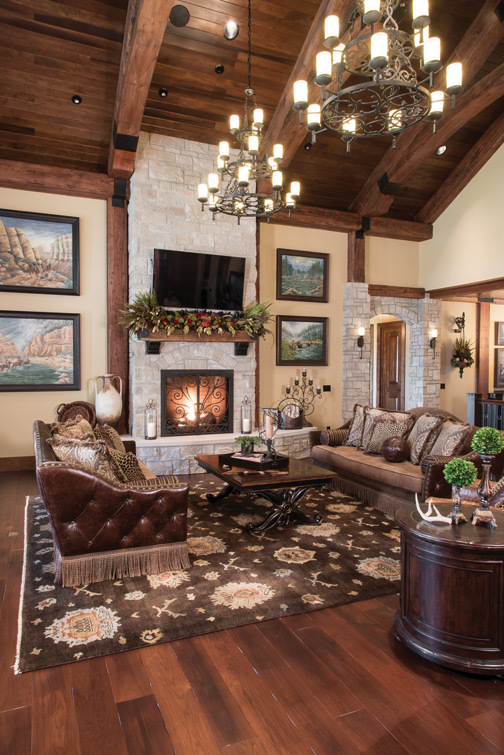 Designed by Architextures and built by Kuehnle Construction, the end result is an expansive “ranch,” with the primary living spaces on the main floor and a fully finished lower level totaling nearly 8,500 square feet, plus a guest suite located above the five-bay garage. It’s obvious upon entering the grounds that there’s something very special ahead. Much of the rock excavated there was used to build the entry bridge, and a spectacular weathered limestone waterfall that flanks the drive and was designed by Lawn Systems Inc. A short distance further, the “lodge” comes into view, superbly oriented on its multilevel site and offering magnificent views of the river from every room on the main level. The exterior and porte cochère are lavished with cut Auxvasse limestone and brick, and the emphasis on natural materials continues into the foyer, where the floor planks are laid in a herringbone pattern and framed with slate tiles. From this point on, every interior space further demonstrates Christi’s skilled use of natural elements and exceptional ability to collaborate with her clients. Wood, sourced from Historic Timber and Plank, is the predominant material throughout. Wide-plank, hand-pillowed hickory blankets virtually all of the floors. Ranging in height from 10 to 22 feet, many of the ceilings are lined with pine planks and feature massive wood beams, each weighing up to half a ton and reclaimed from a historic Cupples warehouse in downtown St. Louis. 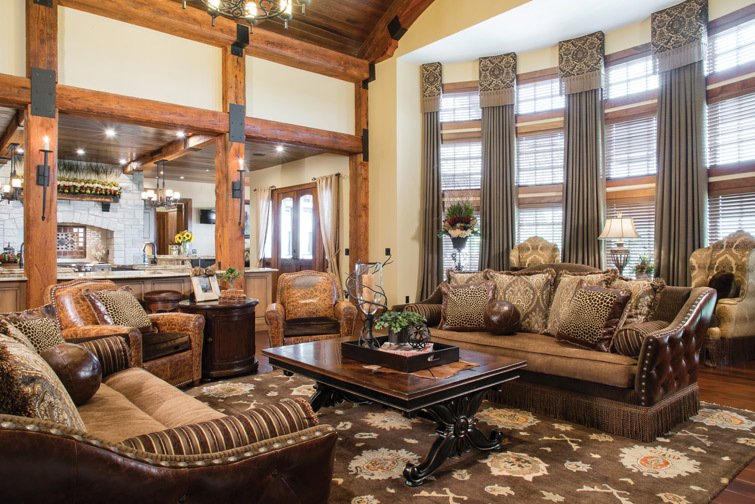 To achieve the desired effect, the furniture was acquired from three Texas firms specializing in rustic modern, Western ranch, and Tuscan styling. Metro Lighting supplied most of the light fixtures and local artist Allison Larkins produced the Tuscan-like canvases and faux-finish paintwork that add character throughout the home. Larkins’ talents are on full display in the formal dining room, where the embossed metal ceiling is faux-painted to resemble leather and a vibrant street scene dominates the side wall. The solid alder dining table seats 10 and is surrounded by Caspar chairs in leather and distressed velvet. Definitely a show-stopper, the great room combines all of the chosen elements, with a dramatic beamed ceiling; stone-faced, floor-to-ceiling fireplace; leather-and-velvet Escapade sofas trimmed with fringe; and an oversize leather ottoman, also fringed. The 20-foot windows are appointed with individual fabric-covered cornices designed by Christi, and heavy, striated drapes match the scale of the room without obscuring the panoramic river views. Adding a colorful provincial touch, she anchored a large dried flower arrangement by MKS Designs to the mantel beam. In the vast, wood-ceilinged kitchen, another of these floral arrangements draws attention to the limestone alcove housing the Wolf range, and the backsplashes are decoratively tiled in terracotta-hued crackled glass and bronze. Three granite-topped islands provide plenty of workspace and include a prep sink and farmhouse sink in hammered copper. Concealed in the cabinetry and island bases are a warming drawer, beverage cooler, icemaker and four Fisher & Paykel drawer dishwashers. “Formal but casual,” the adjacent breakfast nook overlooks the river and outdoor entertainment area. 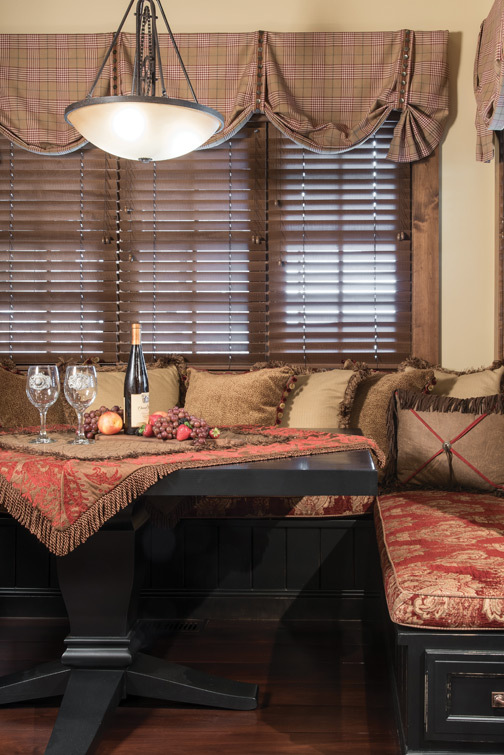 The bench seating has built-in storage drawers underneath and, upholstered in plush distressed chenille, invites guests to settle in with a good book. Luxuriously appointed in sculptured velvet and faux fur, the main-floor master bedroom features a wrought-iron balcony with views to the Arch and opens to a stunning, wood-beamed sitting room with floor-to-ceiling fireplace. On the lower level are two additional bedroom suites and an entertainment venue that almost defies description. The bar floor is covered in multicolored slate, the cork walls have a leather-look finish, and the counter is fitted with a copper bucket sink. 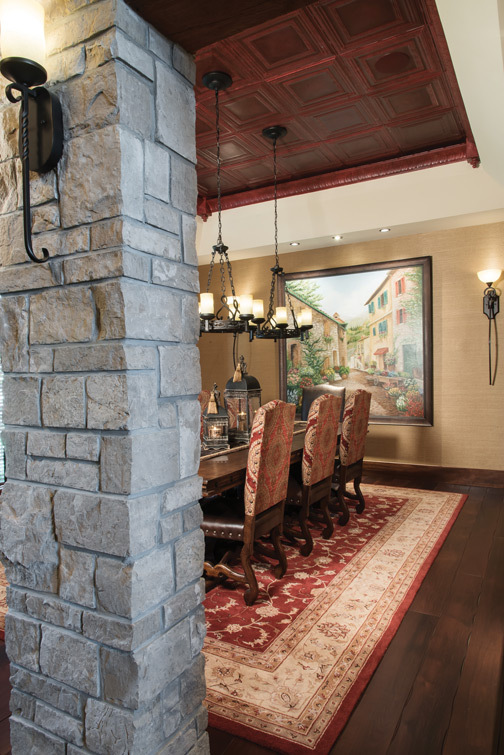 Directly adjacent to the bar area, a stone arch accesses the Tuscan-themed wine room. In the spacious multilevel theater, the acoustic wall panels are wrapped in the same cork material, and tucked under the curved, live-edge counter are playful leather bar stools with furry Western “chaps." Truly a masterpiece, this extraordinary residence is a tribute to Christi Johaningmeyer’s design skill and her team's efforts — an expert blend of rustic mountain styling and comfortably elegant décor, worthy of its majestic setting on the bluffs of the legendary Mississippi.